ICC Examin (unix name: iccexamin) is a viewer for the internals of a ICC profile. ICC Examin was completely rewritten in QML for Android. Version 1.0 covers most of the ICC standard v2 and v4 tags and shows them graphically. ICC Examin is configurable by Oyranos. Meaningful colours are drawn using the monitor profile. 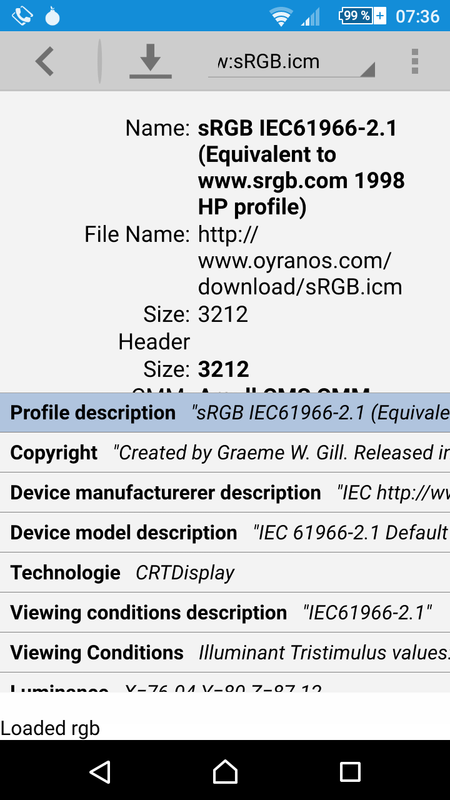 Device dependent measurement data are visualized by requesting standard profiles from Oyranos and rendered to the monitor profile with the littleCMS library. ICC Examin can be called from CinePaint to examin embedded profiles or watch image colour samples in the images colour space gamut hull. User documentation is available on the ColourWiki site.